The success of your business begins with a plan. A document that lays out where you want to be and how you’re going to get there. With regard to your marketing strategy, you set your goals; Double W develops your plan. 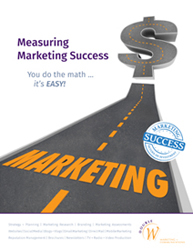 Already have a marketing plan? Great! We’ll start from there. They don’t realize that all marketing tactics—websites, brochures, [fill in the blank]—are tied together. They work in concert, not in isolation. Additionally, marketing is not a one-and-done. It’s not just a website, and done… just a brochure, and done… just a [fill in the blank], and done. Marketing is an ongoing process. Successful businesses never stop marketing. They develop a plan and execute it throughout the year. That’s why we start with a plan. Once your plan (including its timeline and budget) has been approved, Double W begins its execution. We handpick the creative team—copywriter, graphic designer, web developer, videographer, photographer, and the like—as determined by the needs of each project. During this phase of a project, the team conceptualizes how the material should be presented for maximum effect. As the client, you are presented with design ideas and concepts for approval. Once the team has established an overall concept, the individual members go to work. Under the guidance of a project manager, each team member focuses on his individual area of expertise, but never loses sight of the project’s overall concept and purpose. The project manager is in frequent contact with you and the rest of the team. During this phase, you have the opportunity to discuss changes and make revisions to the project. Your message is delivered to your target audience. 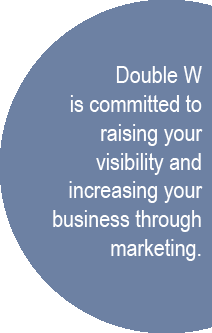 At Double W, we are commited to raising your visibility and increasing your business through marketing. That’s what you expect, and that’s what Double W delivers. The success of your business begins with a plan. So let’s start there. When Sal placed his speech onto the podium and glanced across the large audience, he began to sweat profusely.